In the 1970's, a group was formed to protect the land known today as Hemlock Bluffs Nature Preserve. With determination and hard work, the Hemlock Bluffs Preservation Society was successful in their plan to protect the nature preserve under the jurisdiction of the State of North Carolina. 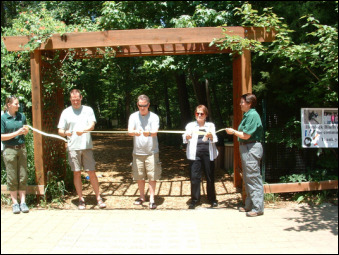 In 1995, the Cary Women's Club provided infrastructure and officers to create a support organization for the Preserve and the Stevens Nature Center. The founding members of the Hemlock Bluffs Preservation Society approached the Cary Women's Club and suggested that they use the original group name and articles of incorporation, since the group had never officially disbanded. With the consistent support of the Cary Women's Club, the Hemlock Bluffs Preservation Society funded exhibits, resources and equipment, and support for the organization grew. In 2001, the board adopted the name "Friends of Hemlock Bluffs" to emphasize the group's mission of supporting Hemlock Bluffs Nature Preserve and its environmental education efforts. 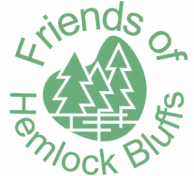 Please join the Board for a meeting and see how you can get involved with the Friends of Hemlock Bluffs. Email us at fohbsecretary@gmail.com to find out more! Congratulations to Tullie Hoyle-Johnson on her retirement from her work of 30 years at the NC Museum of Natural Sciences in Raleigh and for the great honor of being awarded The Order of the Longleaf Pine award by Governor Cooper! Most recently she has been head of volunteers and interns, Tullie has served on the Board of the Friends of Hemlock Bluffs for over 25 years.